Logistically well placed near Grantham, Lincolnshire, QK Coldstores (Marston) Ltd (QK) provide BRC certified storage and distribution solutions within the highly competitive food industry. 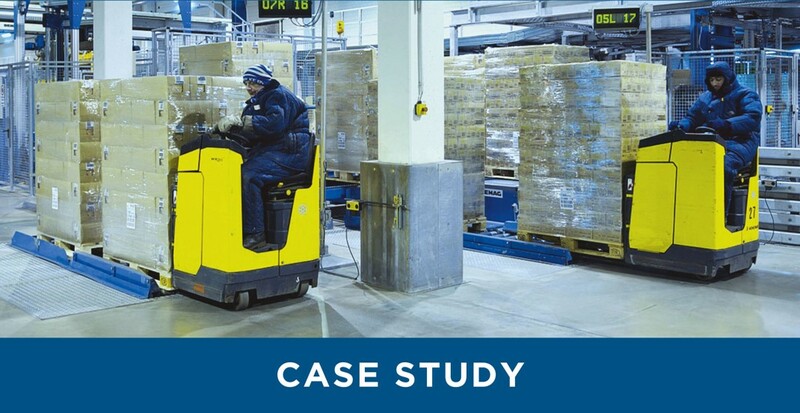 With a frozen storage capacity of over 28,000 pallet locations they provide highly efficient blast freezing, defrosting, food handling and ambient storage capabilities to meet customers’ unique specifications and requirements. QK’s aim is to provide all their customers with a comprehensive and efficient cold storage and distribution solution. With a number of systems in place to support the supply chain requirements of their end users, QK recognise the value technology adds to their operational processes. Darrell Swain, Business Development Manager at QK comments, “At QK we have over 120 trucks come through our operation every day, stock turnaround is quick and we are often full to capacity which is really the key driver in the automation of our warehouse and distribution processes”. Using Empirica, the warehouse management software by Chess Logistics Technology, QK integrated RF technology, designed to enable their end users to access real time stock information from anywhere in the world. The system had been in use for several years and QK were looking to upgrade the rugged hardware element of the system, Darrell continues, “support and reliability was the main factor in the decision to upgrade our RF system. Maintaining reliable, efficient and real time operations allows us to deliver the service and flexibility to our customers., We cannot afford any downtime given the speed of turnaround required in our operation”. The upgrade also required a full Wi-Fi site survey from which TouchStar made a number of recommendations to improve connectivity and future proof the operation, Darrell continues, “We worked closely with TouchStar and planned a staged rollout with respect to the infrastructure upgrade. Not only were we impressed with the smooth rollout, we have already been able to easily extend coverage into two new areas within our operation”. The technology upgrade has delivered numerous advantages to QK. Successful integration with Chess’s Empirica software enhances the functionality specified within the system. By automating a lot of the manual processes, the system has streamlined the end to end supply chain operation. For goods in, EDI interactions with Chess’s Empirica software means that QK can part receive goods before they arrive. The integration of RF provides further validation for the receipt of goods, confirmation of order and pick for dispatch. Upon dispatch, the system automatically generates and communicates a unique booking reference for the customer to provide additional validation upon collection. The dispatch is validated by RF and the system will auto generate an advanced shipping note to the customer. The integration and data collection capability mean that QK have real time visibility of their operation, 24 hours a day, 365 days a year. For their customers, any number of reports can be generated or automated and emailed within minutes, from customer stock to full traceability reports. QK’s customers’ systems are also fully integrated with the real time system, which means that QK have even better control over the entire supply chain. In relation to product status changes, QK are able to isolate any product in the food chain for further investigation and testing. Darrell continues, “We also have access to detailed information on things like pallet information, whereby the system controls product placement by factors such as pallet weight and dimensions. Integrated with RF, this provides details of the optimum place for product put away for maximum warehouse utilisation”. The solution has provided high speed data capture and fast efficient data communication but most importantly the reliability that is fundamental to the running of QK’s operations. Darrell concludes, “Having worked with TouchStar for over 10 years our relationship has gone from strength to strength. In that time the support from TouchStar has been exceptional and they have always been on hand to provide advice and resource when required. We are delighted with the TouchStar solutions we have in place, they just work, the hardware is reliable and robust and it plays a fundamental part in the success of our operation”.